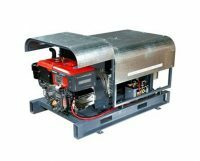 Purpose-built to match the engine to the constant running load of the irrigator motor, and alternator to the starting capacity of the irrigator motor. Can be matched to 3-phase irrigators from 3-9 spans, with or without end booster pumps. Can also be paired with any of the Yanmar Engine Protection or Control Systems. All outlets and circuit breakers are weatherproof.